Its present is grim, its future uncertain—but is it a failed state? But was it true? Was Mexico at risk of becoming a failed state? In recent years, the U.S. military has hardly been alone in promulgating this notion. It is now common to read that Mexico is collapsing, and the daily horrors that emerge from the border city of Juárez—across the Rio Grande from El Paso—would seem to confirm this view. Five years after Calderón deployed the military against the growing dominance of the drug cartels, the city remains paralyzed by violence. The British journalist Ed Vulliamy—whose book Amexica: War Along the Borderline is by far the best account of the current crisis-estimates that the total number of homicides in Juárez since late 2006 now stands at more than 8,200. Meanwhile, the usual figure given for drug-related murders in Mexico as a whole since the end of 2006 is more than 34,000. So far at least, the Calderón government’s decision to deploy substantial military forces in the cities along the U.S. border and appoint a number of retired senior officers to reform a largely corrupt and terrified state police apparatus has only led to more violence. This is not to say that there have not been successes, with many leading cartel figures killed or captured. But, to date, militarization of the conflict has not made a dent either in the violence or the flow of drugs into the United States. The near-constant stream of reports detailing kidnappings, beheadings, and torture continues apace. All of this would seem to suggest that the pessimism of the U.S. military back in 2008 was justified—that Mexico is in fact a failed, or at least a failing, state. And yet, as grave and as horrifying as all this is, it’s worth pausing to ask whether the label “failed state” is really the most accurate, or useful, way to think about our neighbor to the south. When people talk about Mexico as a failed state, what they seem to be discussing is not the Mexico of today but the Colombia of 20 years ago. (Generals, apparently, are not the only people always well-prepared to fight the last war.) From the 1980s to the early ’90s, the Medellín and, to a lesser extent, the Cali cartel posed a genuine threat to the Colombian state. To be fair, some of the similarities between Colombia and Mexico are startling, most notably that Medellín then was what Juárez is today—the city with the highest murder rate in the world. But it is also important to consider the differences. The Colombian narco-traffickers had complicated but extremely important links with both the left-wing FARC guerrillas and the right-wing paramilitaries. The result of these connections was that the leaders of the cartels, most famously, Pablo Escobar Gaviria of the Medellín cartel—in 1989, Forbes magazine described him as the seventh-richest man in the world—became important actors on the political and military fronts of a two- and sometimes three-sided, low-intensity insurgency that verged on civil war. Escobar really was like a character out of a Gabriel García Márquez novel, fascinated by power and with political ambitions from the start. In 1982, he had been elected on the Colombian Liberal Party list as an alternate representative from Medellín to Congress. He never gave up his ambition to play a political role, advertising it to the media even in the last year of his life, as government forces were hunting him down. In contrast, while Mexicans are profoundly divided about how to respond to the cartels, no one I have spoken with has ever suggested there is credible evidence that any of the cartel leaders have Escobar-like ambitions—or any national political agenda. This emphatically does not mean that what the drug lords want is not terrible enough. How else can one describe their demand that the Mexican state give them a free hand to run their domestic production and cross-border smuggling operations, as well as to go after their real and supposed enemies, and, indeed, anyone who gets in their way or who is just in the wrong place at the wrong time, with complete impunity? To do this, the cartels have not just bribed enormous numbers of policemen and local officials, but, in at least one case, helped elect someone to the Mexican Congress. Still, to say that the cartels represent a fundamental challenge to the Mexican government as a whole—a rebellion on the scale of what took place in Colombia or what is taking place now in Pakistan—would be hyperbole. Indeed, the Mexican state is in important ways both stronger and more successful than many Americans seem to realize. In the area of public health, and, more broadly, in poverty reduction, Mexico has far more to teach than to learn. The country is generally thought to have handled the H1N1 panic better than many rich countries. And the Mexican government’s social-assistance program, now known as Oportunidades—which skillfully and creatively uses a range of assistance, from conditional cash transfers to health and nutritional support—has been enormously effective in changing the status of Mexican women (who are the program’s recipients), improving the health of children, and lifting large numbers of people out of poverty. Oportunidades’s global reputation is such that Michael Bloomberg gave the okay for an Oportunidades pilot program in New York City. The Ministry of Social Development (SEDESOL in its Spanish acronym) is a model of what such an agency should be, and development experts around the world speak of it with a respect sometimes bordering on awe. 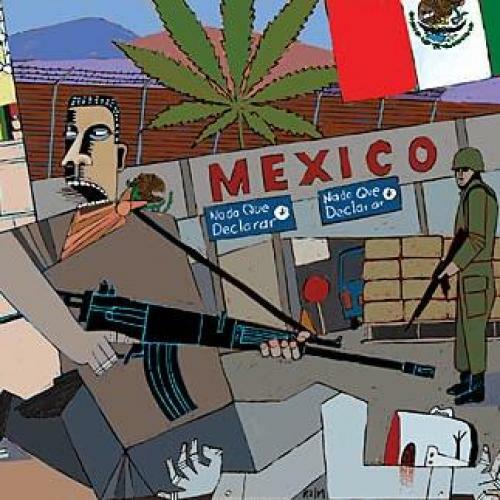 Significantly, the corruption that bedevils Mexican law enforcement has no equivalent whatsoever in the social sphere, and, despite the drug crisis, SEDESOL goes from strength to strength. On the economic side, while Mexico remains heavily dependent on the remittances of the millions of immigrants now working, legally or illegally, in the United States, the country also has a rising middle class. It is common to associate the Mexican economy with Pemex, the state oil company, which the government has tended to loot—in the process, depleting oil revenue that should have been put to work on modernization of drilling infrastructure, particularly offshore, which, if Mexico is to continue as a major petroleum exporter, is where it must hunt for new resources. (The contrast with the much better-run, state-controlled Brazilian oil giant, Petrobras, or Malaysia’s Petronas, is painful.) But, increasingly, there is also the Mexico of Homex, a company started in Sinaloa in 1989. Homex is now one of the leading global firms involved in the building of low- and middleincome housing, with large operations in Brazil and India as well as in 20 Mexican states. And yet, the only thing most non-Mexicans who are drawn to the failed-state hypothesis seem to know about Sinaloa is that it gave its name to a powerful drug cartel. If one takes the long view, the clash between the Mexico of Pemex and the Mexico of Homex may be as important as the war between the cartels and the government. And, unless the Mexican economy implodes, which is highly unlikely, there is an excellent chance that the Mexico of Homex will prevail. In any case, it is a contest in which the narco-traffickers—even narco-traffickers operating right alongside the Homexes of Mexico—do not now have, and will never have, a say. Most important of all, Mexican democracy, deformed for so long during the decades of rule by the Institutional Revolutionary Party (PRI), is now strong. This is actually quite remarkable, because what is too often forgotten is just how young a democracy it is. The great Mexican historian (and frequent New Republic contributor) Enrique Krauze characterized PRI rule as “a collective monarchy with the electoral forms of a republic.” That monarchy disappeared in 2000 when the opposition National Action Party (PAN), led by Vicente Fox, swept into office. (Calderón, his successor, is also a member of the PAN.) In this, a strong analogy can be made to France, where, from the founding of the Fifth Republic in 1958 to the election of the Socialist François Mitterrand in 1981, it seemed somehow inconceivable that the country would ever have a president who was not from the right. Ever since Mitterrand, though, neither the French right nor the French left has been under the illusion that the Fifth Republic somehow “belongs” to them. History suggests that, while democratic states can go through terrible periods and face daunting crises—both of which, unhappily, look to be in the cards for Mexico—they almost never become failed states. This is what makes the Joint Forces Command’s linking of Pakistan and Mexico so unconvincing. If Pakistan becomes a failed state—and, while not likely, unhappily, the possibility can’t be excluded—it will not only be because of the threat posed by the Pakistani Taliban, the other jihadi formations, and some separatist groups, but because Pakistani democracy is a sham. There are other ways in which it is important to distinguish Mexico from Pakistan. The government in Islamabad has done virtually nothing, and seems to care not a whit, about the country’s poor, whether in terms of their health and general nutrition, their educational opportunities, or their chances of finding work. Moreover, unlike Pakistan, Mexico is not a religiously divided country (the contest for adherents between the Catholic Church and its increasingly successful evangelical rivals is impassioned, but it is neither violent nor a challenge to the state’s authority). Nor is it a country facing a population crisis: The average age in Mexico was 17 in 1980; it is 28 today, and Mexican birthrates are in free fall. Pakistan’s birthrates, by contrast, continue to rise, which makes the chances of even a decent government providing reasonable levels of employment a long shot at best. Finally, Pakistan’s only powerful neighbor with whom it could plausibly link its economy happens to be its chief rival, India. The Mexican economy, by contrast, is now thoroughly interconnected with America’s. Which means that, barring a complete collapse of the capitalist system, Mexico’s economy will always have a floor from which to build. One reason to resist, or at least complicate, the failed-state label when talking about Mexico is that such language can lead policymakers down a disastrous path. For one thing, when we speak of failed states, we tend to imagine that the only solution is a military one—and, as the failure of the Mexican military to pacify Juárez shows, the solution to Mexico’s problems cannot simply be more tanks in the streets. But the biggest downside to labeling Mexico a failed state may be that it allows us to ignore our own complicity in the country’s problems. The sad fact is that the power of the drug cartels largely reflects demand in the United States. Castañeda, who was foreign minister in the first years of the Fox presidency, has called for the immediate legalization of marijuana, and it’s no surprise that many Mexicans now support him. Even those who disagree—such as Castañeda’s protégé during his time as foreign minister, Arturo Sarukhan, now Mexico’s ambassador to the United States—concur that U.S. demand is the basis of the entire problem. Meanwhile, America’s grotesquely lax and, in any case, widely unenforced gun laws have made U.S. gun shops, particularly in Arizona and Texas, the de facto arms providers of the cartels. No doubt the cartels could find other ways to supply themselves with weapons if the United States ever did crack down on gun sales (presumably by buying them from soldiers and policemen). Still, America’s insistence on easy access to guns has hardly helped the situation. Unfortunately, rather than revisiting our approach to drugs or guns, Americans seem more disposed, as Governor Rick Perry of Texas demonstrated last year, to contemplate the possibility of U.S. military forces being committed to the fight in Mexico. Perry, to be sure, was quick to say that he would only favor such a move if the Mexican government approved it, as if Mexico’s government would ever really authorize U.S. troops to effectively invade the country for a third time. But his comments illustrated the narrowness of thinking about Mexico among American policymakers. To her credit, Secretary of State Clinton did say during her fencemending visit to Mexico City in 2009 that—given America’s “insatiable demand for illegal drugs” and its “inability to prevent weapons from being illegally smuggled across the border”—it was unfair “to be creating a situation where people [in the United States] are holding the Mexican government and people responsible.” But, as has so often been the case with U.S. policy toward Mexico, the secretary’s rhetorical leap into richly deserved self-criticism led to virtually no substantive policy changes. The war of the drug cartels against the state and its people is scarcely the first terrible war that Mexico has endured. The Cristero rebellion of 1926-’29—which was a response to both a real and, even where it did not actually occur, perceived repression of the Catholic faithful by a central government in Mexico City intent on pushing the historic anti-clericalism of the Mexican state to its limit—cost the lives of nearly 90,000 people and sent another 50,000 into exile, mostly to Los Angeles; this, at a time when the population of Mexico was about 15 million. Of the 4,500 priests who had served the country before the uprising, only a few more than 300 remained eight years later, most of the rest having been expelled, and some—like the priest on whom Graham Greene based his novel The Power and the Glory—hunted down and killed. It took Mexico a long time to recover from that event, and, even if one is optimistic about Mexico, as I am over the longer term—and not just in the sense of the icy, comfortless certainty that, in the long run, all wars end—it is too much to hope that these drug wars will leave it unscathed. The danger is not that Mexico will become a failed state, but rather that the experience of this violence will somehow profoundly brutalize Mexican society. The cruelty with which the narco-traffickers kill, even if most Mexicans only read about it or see it on television, cannot help but be profoundly dispiriting. Cruelty is not just an act; it is a culture. As a result, Mexicans are justifiably worried about their future. “I fear the next ten years will be lost,” was the way a friend of mine in Mexico City put it to me recently. So Mexico certainly has deep and substantial problems to confront. But, while those problems are real, it would be nice if people in the United States would stop writing Mexico’s obituary by declaring it a failed state. The situation is far too complicated for such sweeping pronouncements. Empty expressions of solidarity, meanwhile, as in the case of Secretary Clinton’s 2009 visit—where she delivered the geo-political equivalent of a “Get Well” card bought in the hospital gift shop—may not do any harm, but they certainly don’t help. What might be of some real use would be to take a step back and actually think about how our drug and gun policies are affecting Mexico. Unfortunately, in contrast to my guarded hopes about Mexico’s long-term future, it’s hard to be optimistic that the United States will revisit these issues anytime soon. *Correction: The original version of this article stated that 66 journalists had been murdered between 2005 and 2011. In fact, 66 journalists have been reportedly murdered between 2000 and 2011. We regret the error. David Rieff is a contributing editor for The New Republic. This article originally ran in the April 7, 2011, issue of the magazine.